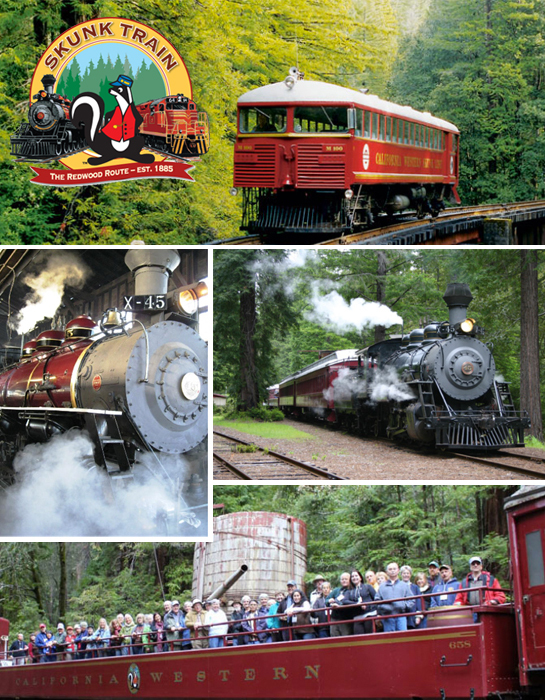 Welcome to the world of Mendocino County, home of the famous Skunk Train. The California Redwoods provide an awe-inspiring backdrop for this piece of American history. The Skunk line operates different trains to power your journey into the redwoods. Depending upon your travel plans, you can ride the rails on an exciting variety of equipment. The vintage 1925 M-100 railcruiser, the only remaining train of its kind in use today, as well as the 1935 M-300 railcruiser run the line all year round while the diesel powered engines, or the famous "Ole' No. 45" Baldwin Steam Locomotive reigns supreme mostly during the summer months.